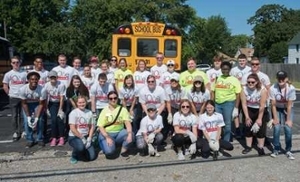 Before their first day of classes, approximately 650 incoming Southern Illinois University Edwardsville freshmen were loaded into buses on Saturday, Aug. 19 and transported to Metro East farms, gardens, wetlands and more to learn a valuable lesson about community service. The locations were chosen based on their needs and because some are in partnership with SIUE, according to Laux. For example, La Vista CSA Farm provides produce for Campus Kitchen at SIUE. Watershed Nature Center is an organization dedicated to providing environmental education, passive recreation, and enjoyment of native habitats. Willoughby Farm is part of the Collinsville Area Recreation District (CARD). It is a place where the history of the area comes alive through historic structures, original tools, replica gardens and a restored environment. Arlington Wetlands is an American Bottom wetland acquired by the Collinsville Area Recreation District (CARD) with efforts to bring the land to full restoration. Because of its proximity to the confluence of the Missouri, Mississippi and Illinois Rivers, Arlington Wetlands plays a major role in the migration of waterfowl throughout the year. 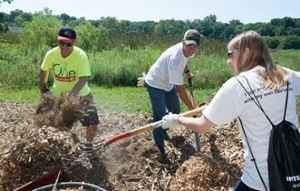 The Granite City Community Gardens (GCCG) is a network that brings neighbors together to create and sustain gardens that benefit the Granite City community. La Vista CSA Farm is community-supported agriculture. Beverly Farm is home to nearly 400 individuals who live with intellectual and developmental disabilities. Garden of Harmony (Aya Grows) is a nonprofit initiative in East St. Louis that invests in ecological enrichment, community solidarity and personal empowerment through creative community-based place making. Pulling weeds at the Granite City Community Garden are L-R: Brenden Canada, of Belleville, and Dylan Wesley, of Robinson. Hard at work at the Watershed Nature Center are L-R: Chancellor Randy Pembrook, James L. Harrold III of Clinton, and Claire Iott of Normal. 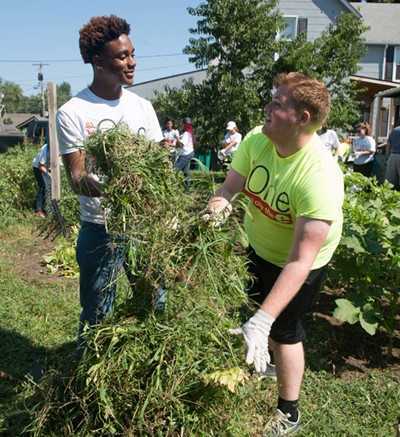 A group of SIUE incoming freshmen is ready for a hard day’s work at the Granite City Community Garden.